Last week we learned that the Board of Trustees of the Baltimore Opera Company voted to convert their reorganization to a chapter 7 liquidation. Indeed, on March 18th, United States Bankrutpcy Judge Nancy Alquist entered an order converting the case to a liquidation. Brian A. Goldman was appointed as the Chapter 7 Trustee. A Meeting of the Creditors will be held on April 27, 2009 at 12:00 PM at 341 meeting room #2650 at 101 W. Lombard St. in Baltimore. On March 23rd, the Chapter 7 Trustee filed a notice that there are assets. Proofs of claim are due by June 22, 2009. The case number remains 08−26265. A free proof of claim form can be downloaded from www.uscourts.gov. 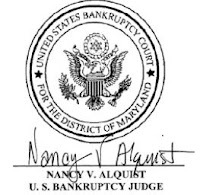 I'm not offering legal advice, but if I were sending my own claim in for filing, I'd send it to the United States Bankruptcy Clerk, Baltimore Division, Garmatz Federal Courthouse, 101 West Lombard Street, Suite 8530, Baltimore, MD 21201. I would include an extra copy and a self-address pre-paid envelope so the clerk could send me back a filed-stamped copy for my records. Is there a website to access the bankrupcy court information? You can use your credit card and it's cheap - 8 cents a page.